The truth of the matter is that heroic academics are just regular academics with two uninspiring credentials: good connections and a healthy dose of luck. A hard work ethic and an agile mind – which is to say a normative talent set at the graduate level – sets almost no one apart. This is a sweeping assumption that dismisses the value of identifying people who are unusually successful (here, in academics, but in principle in any industry). Identifying the unusually successful from the merely excellent is actually hard work, and is something that a 'big name' is supposed to help people sift out those worthy of emulation. I also think it's telling that in the anecdote recounted here the 'worshippers' are at a more advanced stage than the author (PhDs to his masters). I think the further through you get, the more you can track your own improvement, and that makes you realize how valuable experience is. I'm a couple of years into (what I hope will become) an academic career, and revising my doctoral thesis for publication. Re-reading stuff I wrote just a year or two ago makes me cringe, and makes me realize how much I've developed. If I think my ideas now are worth much more than my ideas were two years ago, why wouldn't I respect someone with ten times that extra experience? You don’t need to pay for the building you’re in and you can work in the dark. The budget doesn’t include overhead. You don’t really want to analyze or store the data. The $1000 might get you a basic alignment, but nothing else. Besides overhead, analysis of data has become, and probably will remain for the foreseeable future, the more expensive part of doing genomics. I haven't posted anything in the past several weeks as I've been incredibly busy with a whole series of projects. This is even despite going to AGBT 2014 and seeing the GenapSys presentation (Wow. Just wow.). 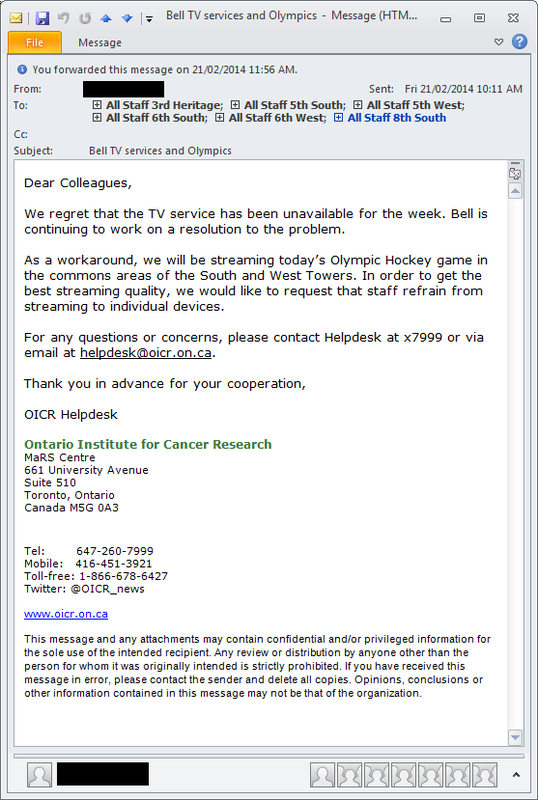 Today, everyone at OICR received the following email, which must be either the most awesome or most Canadian thing I've ever heard of from anyone, anywhere I've worked before. In 2012, US scientists and social scientists estimated that they read, on average, 22 scholarly articles per month (or 264 per year). That is, statistically, not different from what they reported in an identical survey last conducted in 2005. It is the first time since the reading-habit questionnaire began in 1977 that manuscript consumption has not increased. Aside from the levelling out of article readings, the latest survey of 800 scholars, which is due to appear in the journal Learned Publishing, also finds that the time taken per article seems to have bottomed out at just over half an hour. Anecdotally, I'd have to say this study hits the trend bang-on. 22 articles per month at half an hour each is actually a pretty low commitment, if you consider how articles are being read by many people. When articles were only available in print, it was implicitly assumed by communication analysts that researchers always read manuscripts in their entirety, as if a ‘scholarly article’ was an object to be consumed as a whole. That may never have been true, he says: most of the time, scholars were likely scanning for particular snippets of information. To understand a new idea. This is the real learning, and learning takes effort. This is also where you really have to study the article in depth to avoid missing details that don't seem relevant at first glance. If you're out of your usual area of expertise, you need to understand the context of why the final product is scientifically important, what the assumptions or facts in the report are, how and why the experiments are done (at a technical level). You might also have to re-read the article a second time to really 'get it'. Time alloted: Up to several hours. To stay up to date in your field. Here, you're really just skimming the results and references while still reading the paper. You don't have to study technical aspects of the report because you're familiar with them. Were the experiments actually risky enough to show something daring? Is the result worth citing in the future, or does the paper refer you to other new papers? Time alloted: About 30 minutes. To replicate or adapt some published experiment. You're only interested in one figure in the paper that shows the data you'd like, or think you'd like, to show in your work. The end result of the paper doesn't matter to you, but the methods, software, and reagents actually used matter to you. Just look up the information you need and file the paper away for a rainy day. Time alloted: 10 minutes. There are many other ways of approaching a paper. If you have another way, send in your comments or add them below. Especially if you're a scientist. Bioscience Technology covered a recent paper in Management Science which points out that life sciences investigators see a 12 percent increase in citation rates, on average, after becoming Howard Hughes Medical Institute investigators. Being associated with HHMI is considered prestigious but most accounts. Among the main things the authors observed: Big gains in citation rates post-award were seen for people working in new areas of research, publishing in lower impact journals, and for younger researchers. However, the effect of a new prize isn't very significant if people were publishing work in big name journals already. Since citations are usually given freely, the study does seem to support the idea of prizes as a mark of quality and a signal that reading work from that particular person is more likely to be worthwhile, and in general awards serve to build up a personal brand that's similar to that of big-name journals. Hot journals generally contain quality work, so work from someone who's been recognized with an award should also be interesting (though it's not hard to find lukewarm papers in hot journals, and reading work from HHMI investigators is no guarantee that it will be hot). See the original paper here. Unfortunately, it's paywalled unless you're at an institution that gives you access.